WELCOME TO MY MONEY MISSION ONLINE: GIVEAWAY TIME!! I am having a ton of fun over here at my blog doing giveaways. They are just such a cool thing to offer my readers! And, I promised that I have more, so here's my newest one....And, this one is a dandy! I first became acquainted with Tracy, of the wondeful greeting card company, Sincerely Yours by Tracy, when I won a giveaway over at another blog. When I received my cards in the mail, I was totally amazed at how awesome her cards are and how much time and effort she puts into them! Tracy has generously offered to giveaway, to ONE lucky winner, a package of note cards that you can pick out yourself from here. There are Birthday, Thank You, Just Because, Holiday, Monogrammed, Baby or Newborn, or the Variety Pack. You can also access Tracy's site by clicking on her button that is located at the top Left of my blog! This Giveaway is going to run through October 28, 2010 11:59pm CT. The winner will be chosen by random.org and I'll contact the winner via email. So, be sure to leave your email address in one of your comments, so I know how to get ahold of you! Main Entry: Visit Tracy's site at Sincerely Yours by Tracy and tell me which pack of note cards you'd like to win. If you already do these, just let me know and I'll make sure you get your extra entry(s) in! I am super psyched about this one, since I have already seen first-hand how awesome her cards are, and I just know that the winner is going to absolutely LOVE them also! Have a super-terrific day everyone! I am loving those Celebrate with Jewell card sets! 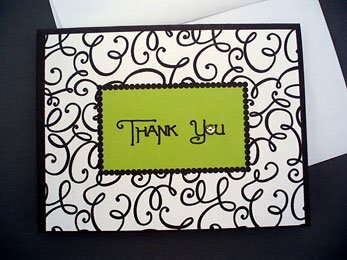 I would love any type of thank you card. Seriously, we go through a ton of them here. We are very thankful people! And I follow you on GFC and Facebook. I love the holiday with peace sign cards. Too cute!! Thanks for your comment on my blog. I am now following you as well. I really like the Holiday Garland w/ Jewel cards! Have a great weekend!! So glad you all like our cards and we are happy to be a part of this Giveaway....Thanks A. Marie for giving us a chance to show our work to you and your friends....We're on facebook so stop by and say hello....Good Luck everyone! I love peace sign cards!! Criminy! That reminds me that I owe Tracy a post too! Gees, if I only had a brain. 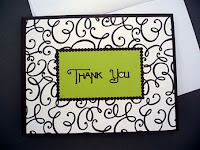 I follow on google reader and I love the monogrammed cards that say A Note From...! Thanks for the chance!